Step 2: Place your cursor next to the text you want to link to, in this case the answer to the 'What kind of artwork can I send?' 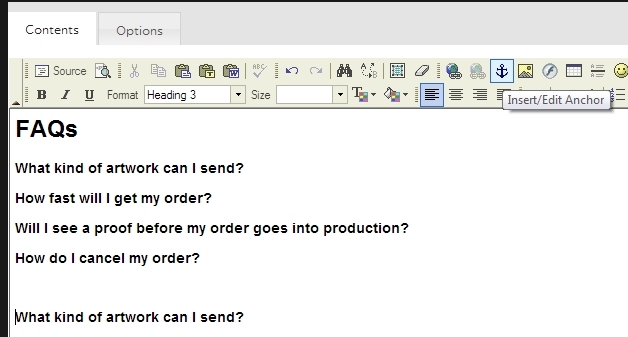 question, and click on the Insert / Edit Anchor icon. Step 3: You'll be prompted to name this anchor. Each anchor needs to be unique. Step 4: When you've created your anchor, you'll see a little gold anchor icon - that's NOT visible on the website, only in this editing portion. Step 5: Next, highlight the text that you want to have link to the answer, and click on Insert / Edit Link. 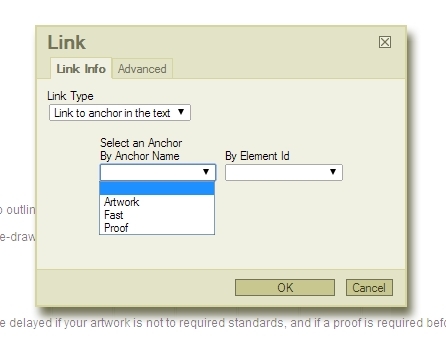 Step 6: From the Link Type drop down, choose 'Link to anchor in the text', and then select which anchor you want to link to. Step 7: Once you click OK, the text will turn blue and be underlined, like a traditional link. Step 8: Click 'Save' and 'Publish' and you'll be able to review the results on your page. See http://promobuyusa.usa.clickpromo.com/frequently-asked-questions to see how the links behave.